Jessica L. Lavariega Monforti is dean of the College of Arts and Sciences at California Lutheran University. Her research primarily focuses on the differential impact of public policy according to race, gender, and ethnicity. Jessica L. Lavariega Monforti, Editor. 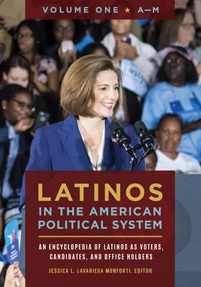 Latinos in the American Political System: An Encyclopedia of Latinos as Voters, Candidates, and Office Holders [2 volumes]. ABC-CLIO, 2019. ABC-CLIO, publisher.abc-clio.com/9781440853470.